Our business attorneys at the IBC Law Firm specialize in a large variety of Internet-related legal issues and marketing services to provide our clients with the expertise and knowledge to navigate the digital world successfully. Some of our legal specialties include resolving domain name disputes and theft, trademark infringement and copyright/DMCA issues, and unfair competition situations. We also provide multiple services in internet-related business matters including affiliate marketing programs, crowdfunding platforms, high-traffic bloggers, and e-commerce companies. With us, you can be confident that you, your brand, and your business will be protected. Copyright protects original works of authorship including artistic works, such as novels, songs, movies, computer software, poetry, architecture, and other literary, dramatic or musical works. Copyright does not protect ideas, systems, methods of operation, or facts, but it may protect the way these things are expressed. To register your desired copyright, you’ll first have to identify the appropriate form to file, pay a $45 fee per work you want to register, and submit 1-2 copies of the work with the Copyright Office. These forms and instructions may be obtained from the U.S. Copyright Office. Processing times vary depending on the type of copyright you’re registering, and the method you used to submit it. e-Filing takes anywhere between 6-8 months, whereas paper forms take between 8-10 months. The effective date of registration is the date the Copyright Office received the completed application, correct payment, and copy(ies) of the work being registered in an acceptable form. You do not need to wait for a certificate to proceed with publication. Works commonly registered are usually “original works of authorship” that are fixed in a tangible form. These can encompass literary works, musical works, including any accompanying words, dramatic works, sculptural works, motion pictures and other audiovisual works. These categories should be viewed broadly and do not include names, titles, slogans, or short phrases. In some circumstances, a logo may receive both copyright and trademark protection. Copyrights cannot protect ideas, concepts, systems, or methods of doing something, unless it’s expressed in a tangible form. In the unfortunate event that your copyright is being infringed upon, there are a number of protections and actions you can take to put an end to it. Enforcement actions include restraining orders and injunctions, money damages, and attorney fees. 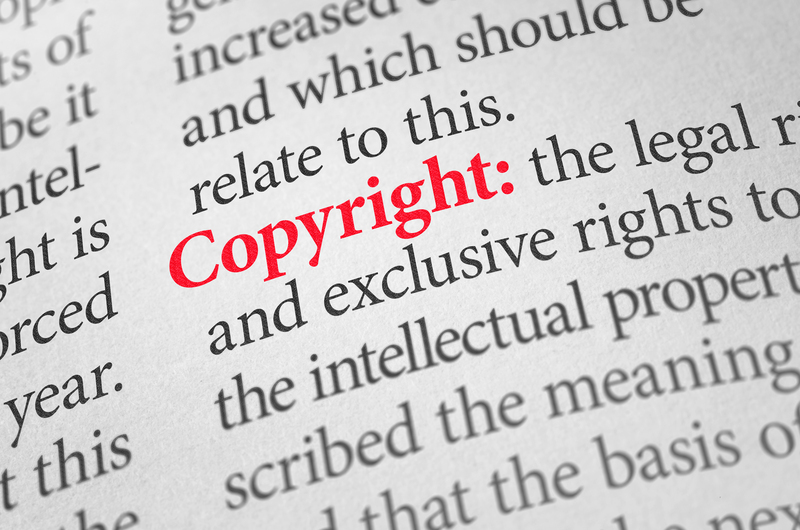 You may also choose to pursue litigation, but registration of your copyright is required for litigation for both published and unpublished works. The most frequent copyright violations are related to computer and digital technology, like software, piracy, file sharing, illegal uploading, burning CDs and DVDs. Common defenses to copyright infringement that are important to know are the statute of limitations defense, if the infringement is allowed under the “fair use” doctrine, if the infringement was innocent, or the copyright owner authorized the use in a license. Ruling out all possibility of pre-existing trademarks that could hinder the approval of your trademark and eliminate all legal complications. Ensuring all documentation is appropriately filled out. Sending in all necessary documents to begin the application process. Keeping up with all USPTO actions on your behalf. Staying on top of all related activity with your application and allowing you to be in understanding of anything that occurs. When received, the certificate of registration will be mailed to you immediately. Knowing what material is copyrighted, what rights you have to use it, and how to file a copyright with the US Copyright Office.